Iron cribs are the way to go if your desire is to create a little drama in your baby nursery. To be honest, the idea of my soft cuddly baby, in a hard metal crib, was initially somewhat disagreeable to me. However, I must admit, the more iron cribs I research, and the more pictures I look at, the more I am warming up to them! 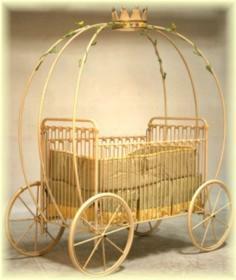 Check out the iron crib section at ababy.com for the widest selection. Most iron cribs come with all the convenience features of standard baby cribs for mom, plus a touch of the unexpected. Drop-down rails on one side of the crib - Allowing easy access, you can even change or dress your baby in the crib. Rolling casters - Allowing you to move your sleeping baby to a convenient place for you to watch him or her. This can be an enormous stress reliever for a new mom. Check for locks on at least two of the casters to prevent unwanted rolling. With the exception of the round ones, iron cribs are sized for standard mattresses and bedding. Therefore, there is the option of using organic crib mattresses and bedding. Organic crib mattresses have been associated with SIDS prevention. Bratt Decor makes iron convertible baby cribs, making them, not only an heirloom, but also a great investment for years to come. They are sturdy and strong. Made from wrought iron or high quality cast aluminum, they are powder coated to resist scratching and peeling. 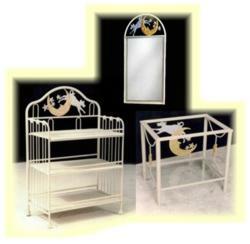 Are available in an extensive range of finishes, allowing you to personalize your metal crib to suit any color scheme. Choose from matte or gloss finishes, distressed, crackled or bubbled textures in a wide range of colors. Can be customized to suit many nursery themes with a wide selection of delightful finials. Come with or without canopies, and posts. Are often offered with coordinating changing tables and other accessories such as, mirrors and armoires. They are very expensive. Starting at around $1000, you can end up paying well over three if you get carried away. This is hardly surprising when you consider the personal care and attention to detail required for each custom-made masterpiece of handcrafted beauty. Each metal crib is custom made to order. This results in a lead delivery-time of between eight and sixteen weeks. Also bear in mind that custom-made cribs are usually non-refundable. Iron cribs are not as readily available as standard baby cribs. You may not find a large selection at your local outlet store. However, if you know where to look, you can find a good variety online. Who Makes Iron Baby Cribs and Where Do You Find Them? The most popular iron cribs can be narrowed down to two brands. Corsican Furniture has been handcrafting the most beautifully dramatic metal cribs for over forty years. Made of aluminum, rather than iron, each piece is cut and bent by hand, and each connecting joint is formed by hand-pouring molten metal into a mold. Every metal crib in the Corsican Furniture line meets CPSC baby crib safety standards, and features a single drop side and 6-positional mattress base. Cribs are available in an extensive range of finishes with canopies, posts with decorative finials, or detailed scroll work. Bratt Decor has been designing and lovingly crafting baby and kids' furniture since founders, Mary and Stephen Bauer were expecting their first baby in 1995. Their iron cribs are made of hand bent wrought iron and aluminum castings, and are finished with a powder coating and hand applied patina. There are two iron cribs in the Bratt Decor line. The Casablanca Premiere and the Venetian Four Poster. Both exceed CPSC baby crib safety standards, feature a single drop side and 3-positional mattress base and convert into a day bed. The cribs are available in an antique white, pewter, slate or venetian gold finish. 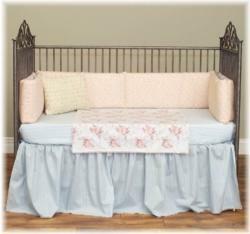 The Venetian Four Poster metal crib can be set up with or without canopy and / or posts. As a result of their durability and timelessness, iron baby cribs can be passed down, from baby to baby, for generations to come. And they are not only built to last, but to deliver a lasting impression - to create the illusion of romance and grandeur in any baby nursery. All in all, iron baby cribs are a wonderful way to create a unique look for your one of a kind baby!